Adhesion mediated through the integrin family of cell surface receptors is central to early development throughout the Metazoa, playing key roles in cell-extra cellular matrix adhesion and modulation of cadherin activity during the convergence and extension movements of gastrulation. It has been suggested that Caenorhabditis elegans, which has a single β and two α integrins, might reflect the ancestral integrin complement. Investigation of the integrin repertoire of anthozoan cnidarians such as the coral Acropora millepora is required to test this hypothesis and may provide insights into the original roles of these molecules. Two novel integrins were identified in Acropora. AmItgα1 shows features characteristic of α integrins lacking an I-domain, but phylogenetic analysis gives no clear indication of its likely binding specificity. AmItgβ2 lacks consensus cysteine residues at positions 8 and 9, but is otherwise a typical β integrin. In situ hybridization revealed that AmItgα1, AmItgβ1, and AmItgβ2 are expressed in the presumptive endoderm during gastrulation. A second anthozoan, the sea anemone Nematostella vectensis, has at least four β integrins, two resembling AmItgβ1 and two like AmItgβ2, and at least three α integrins, based on its genomic sequence. In two respects, the cnidarian data do not fit expectations. First, the cnidarian integrin repertoire is more complex than predicted: at least two βs in Acropora, and at least three αs and four βs in Nematostella. Second, whereas the bilaterian αs resolve into well-supported groups corresponding to those specific for RGD-containing or laminin-type ligands, the known cnidarian αs are distinct from these. During early development in Acropora, the expression patterns of the three known integrins parallel those of amphibian and echinoderm integrins. Integrins are a large family of cell surface transmembrane receptors known only from metazoans, which function in intracellular signalling as well as cell-cell and cell-extracellular matrix (ECM) adhesion . As the main mediators of cell-ECM interactions they are key players in early development  functioning in gastrulation by rapid modulation of their own adhesion between low and high affinity states and by modulating the activities of adhesion molecules (e.g. cadherins) in cell layers undergoing convergence and extension . Integrins function as αβ heterodimers with several subunits of each type being present in most animals. Analyses of the whole genome sequence of Caenorhabditis elegans [4, 5] indicate that it has a single β subunit of the β1 type that is capable of associating with two α subunits, which confer specificity for either laminin- or RGD-containing ligands, and it has been suggested that this may reflect the ancestral state. Drosophila melanogaster has five α and two β subunits  and mammals, eighteen α and eight β integrin subunits . In each case, however, integrin subunits above and beyond likely orthologs of the two αs and one β of Caenorhabditis are clearly lineage-specific. "Lower" animals are of particular significance in terms of understanding the ancestral state, but have not been extensively studied. Both α and β integrin subunits have been identified in sponges [7–9], and cnidarians [7, 10, 11], but the extent of integrin diversity and the range of functions of these molecules in "lower" animals are unknown. Anthozoan cnidarians such as the coral Acropora millepora and the sea anemone Nematostella vectensis appear to have retained much of the genetic complexity of the metazoan common ancestor [12, 13]; hence these animals are likely to be highly informative with respect to the ancestral integrin complement and may provide insights into the original roles of these molecules. Known cnidarian integrins include a β integrin from Acropora millepora  and single α and β subunits (IntA and IntB) from the hydrozoan jellyfish Podocoryne carnea . Here we report the characterisation of novel β and α integrins from Acropora. The known Acropora integrins are expressed during gastrulation in patterns like those seen at the corresponding stages of echinoderm and amphibian development. However, we know from morphological observation [14, 15] that Acropora gastrulation is not a simple epithelial to mesenchymal transition in which the expressing cells lose their adhesivity and invaginate. Instead, in Acropora it is clear that changing cell shape also plays a major role. Two further implications of this work are that the cnidarian integrin complement is significantly more complex than was predicted, and that functional diversification of α integrins may have occurred independently in Cnidaria and Bilateria. Three unigenes encoding integrin subunits were identified during an ongoing EST analysis of Acropora millepora [13, 16]. One of these corresponds to the previously known Acropora integrin β Cn1 ; to simplify comparative analyses, this integrin is henceforth referred to as AmItgβ1. Complete sequences were determined for cDNA clones corresponding to the other two integrin unigenes; comparative analyses indicated that an EST clone corresponding to a second β subunit (AmItgβ2) encodes a full length protein of 771 amino acids, whilst an α integrin EST clone lacked the 5' end of the open reading frame. To complete the 1021 amino acid integrin α coding sequence, overlapping clones were isolated from a cDNA library, enabling the determination of the complete open reading frame for a molecule designated AmItgα1. These sequences have been submitted to GenBank under the following accession numbers: EU239371 (AmItgα1) and EU239372 (AmItgβ2). Database comparisons identified AmItgβ2 as a possible ortholog of integrin β (IntB; Q9GSF3) from Podocoryne . Previously Reber-Muller et al. suggested that Podocoryne IntB was orthologous with AmItgβ1; however, the former not only has higher overall sequence identity with AmItgβ2 (44% amino acid identity compared to <40%), but also shows the same atypical pattern of cysteine residues (Fig. 1, 2) Whereas the β integrin extracellular domain characteristically contains 56 cysteine residues arranged in a specific pattern , in both Podocoryne IntB  and AmItgβ2, cysteine residues at positions 8 and 9 in the canonical structure are absent as occurs in vertebrate β4-type integrins. In terms of most other structural features, however, both AmItgβ2 and Podocoryne IntB are typical integrin βs – the MIDAS domain, cysteine-rich stalk and transmembrane region are all clearly present. In both cases, the DxSxS motif of the MIDAS cation-binding domain  is completely conserved, whereas the DDL motif of the ADMIDAS is changed to EDL in AmItgβ2 (Fig. 1). The cytoplasmic domains contain the conserved membrane proximal sequence KLLxxxxD and two NPxY/F motifs (NPIF and NPTY in AmItgβ2, NPIY and NPMY in IntB). Whereas the degree of similarity between these Acropora and Podocoryne sequences implies that these might be orthologs, one complicating factor is that the Nematostella genome appears to encode two integrins of the AmItgβ2 type (see below). Hence orthology relationships will only be clear when more complete datasets are available for Acropora and Podocoryne. β integrin alignments (amino terminal end of the molecules). Amino acid sequence of AmItgβ2 aligned with representative β integrin sequences. 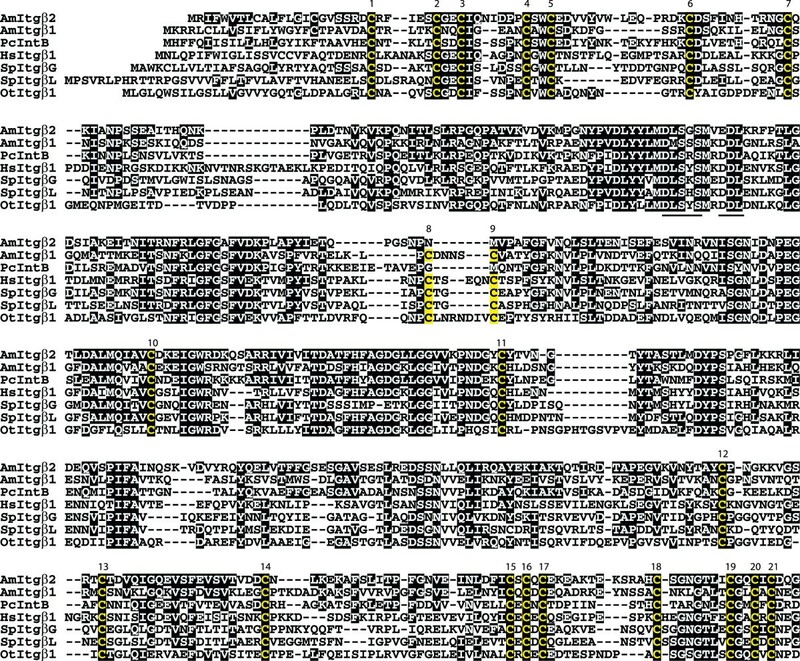 Atypical absence of cysteines (yellow, numbered) from positions 8 and 9 suggests orthology between AmItgβ2 and Podocoryne IntB (PcIntB). 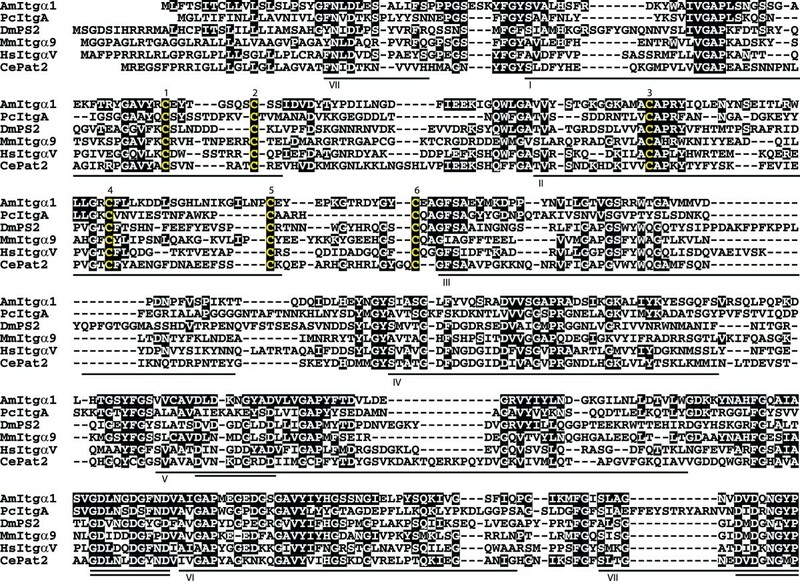 Structural features including the MIDAS motif (DLSXS, underlined), transmembrane region (long wavy line), membrane proximal motif (short wavy line), and two NPxY/F motifs (double underline) are conserved. The ADMIDAS motif (DDL, underlined) is changed to EDL in AmItgβ2. An arrow indicates the position where a deletion was made in the sponge sequence (OtItgβ1) to facilitate alignment. Abbreviations and database accession numbers for sequences used in the alignment are: Acropora AmItgβ2 (AmItgβ2; EU239372); Podocoryne IntB (PcIntB; AAG25994); Acropora AmItgβ1 (AmItgβ1; AAB66910); Human β1 (HsItgβ1; P05556); Strongylocentrotus βG (Urchin SpItgβG; AAB39739); Strongylocentrotus βL (SpItgβL; AAC28382); Ophlitaspongia βPo1 (Sponge OtItgβ1; AAB66911). β integrin alignments (carboxy terminal end of the molecules). See legend for Fig. 1. Comparative analyses indicate that AmItgα1 shares some characteristics with those integrin α subunits that lack an α-A (I) domain. Database comparisons revealed that AmItgα1 is most similar to mouse integrin α9 (MmItgα9; Q91YD5; 28% identity and 48% similarity). Whereas the Acropora and Podocoryne β integrins that are possible orthologs (AmItgβ2 and PcIntB) are 44% identical, the α subunits AmItgα1 and Podocoryne IntA have a much lower amino acid identity (27%), and there are several differences between these that are likely to have functional and/or structural significance. Both proteins are typical in terms of the presence of FG-GAP repeats, transmembrane regions, membrane proximal KxGFFKR motifs and extracellular cleavage sites fitting the RxK/RR consensus (Fig. 3, 4). However, whereas AmItgα1 is typical in having three cation binding motifs (DxD/NxD/NxxxD; ) within FG-GAP repeats V, VI, and VII, the three cation binding sites in Podocoryne IntA are in FG-GAP repeats VI, VII and immediately C-terminal of repeat VII. Both proteins are atypical in terms of the positions of cysteine residues relative to the consensus; AmItgα1 is missing Cys residues at positions 9, 10 and 17, whereas IntB is missing Cys residues at positions 13 and 14, but both proteins have a novel Cys pair between consensus positions 10 and 11. A corresponding extra pair of Cys residues is also present at the same position in both the Nematostella α integrin predicted from the genome sequence (NvItgα1; see below) and the atypical Drosophila integrin PS3. α integrin alignments (amino terminal end of the molecules). The major structural features of alpha integrins lacking an alpha-A domain are conserved in AmItgα1 including seven FG-GAP repeats (underlined, roman numerals), three DxD/NxD/NxxxD cation binding sites (double underline), the transmembrane region (long wavy line) and the cytosolic membrane proximal domain (short wavy line). The position of a putative fourth cation binding site in the Podocoryne sequence is indicated in red. 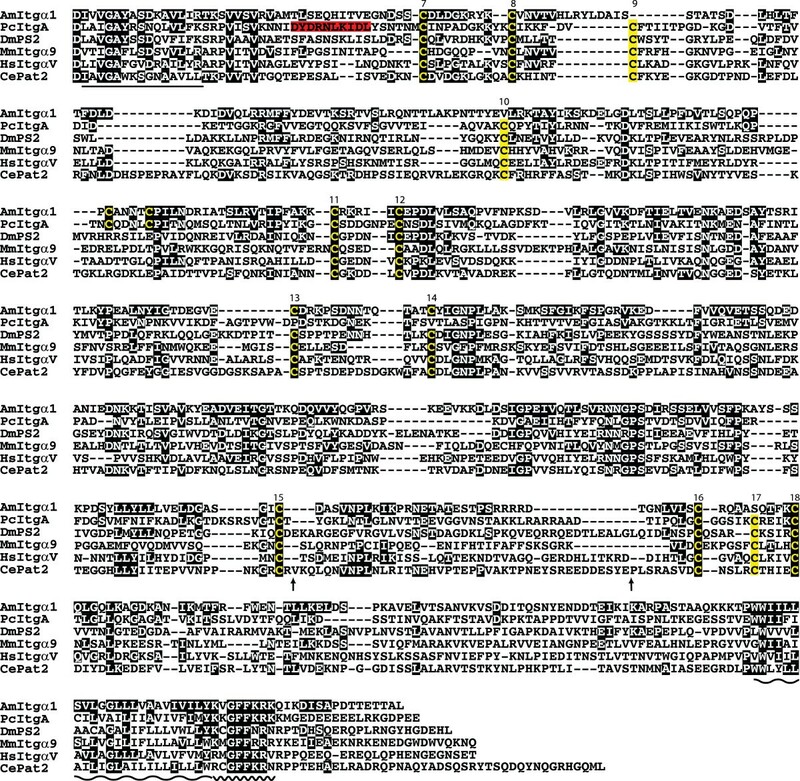 Arrows mark the positions where regions that could not be unambiguously aligned were removed from the Drosophila (DmPS2; 219 residues), Caenorhabditis (CePat2; 132 residues) and human (HsItgαV; 6 residues) sequences. Abbreviations and database accession numbers for sequences used in the alignment are: Acropora AmItgα1 (AmItgα1; EU239371); Podocoryne IntA (PcIntA; AAG25993); Drosophila αPS2 (DmPS2; P12080); Mouse α9 (MmItgα9; NP_598482); Human αV (HsItgαV; P06756); Caenorhabditis αPat2 (CePat2; P34446). α integrin alignments (carboxy terminal end of the molecules). See legend for Fig. 3. To better understand relationships between the Acropora sequences and the major integrin types of higher animals, maximum likelihood (ML) phylogenetic analyses were undertaken using MolPhy version 2.3 . Integrin phylogenetics is complicated by high levels of primary sequence divergence and homoplasy, leading to difficulties in unambiguous alignment of sequences. The analyses presented here are therefore based on extensively edited alignments. Sequences were aligned using ClustalW via the EBI website, manually edited using JalView, and used for phylogenetic analyses. In the case of the integrin α alignment, the output from ClustalW consisted of 2383 positions and was manually edited to 1091 positions (20 sequences). The corresponding figures for the integrin β alignments were 2159 positions prior to editing and 991 after editing (24 sequences). The ML phylogenetic analyses of integrin α sequences (Fig. 5A) are broadly consistent with previous studies; the resolution of bilaterian sequences into two major clades corresponding to the major ligand classes RGD (PS2) and laminin (PS1) is strongly supported. The fact that these two clades each contain protostome (fly, worm) and deuterostome (human, sea urchin) sequences indicates that the functional divergence of α integrins had already occurred in Urbilateria – the common ancestor of bilateral (higher) animals. However, the ML phylogenetic analyses give no clear indication of the likely ligand specificity of the known cnidarian α integrins. The cnidarian (Podocoryne, Acropora and Nematostella) α integrins group together with high bootstrap support (albeit on long braches which reflects their divergence), the sister group of this cnidarian integrin α clade being the α4/9 type integrins (Fig. 5A). Maximum likelihood phylogenetic analysis of representative α and β integrin proteins. Numbers at branch points indicate the percentage of 1000 bootstrap replicates supporting the topology shown (using MolPhy version 2.3; see ). (A) α integrins. Whereas integrins from Bilateria group in a ligand specific manner, consistent with previous phylogenies, the cnidarian sequences form an independent clade, reflecting their early divergence. These groupings suggest that functional divergence of α integrins had already occurred in the Urbilateria. 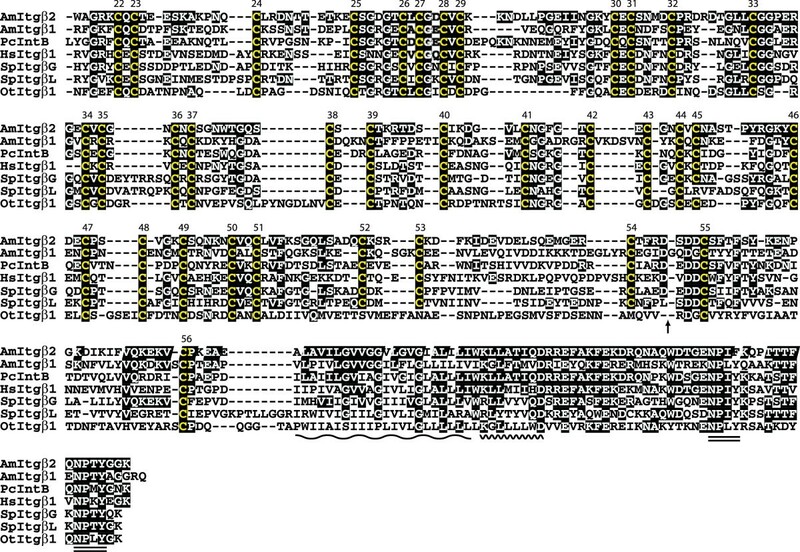 Sequences aligned, abbreviations, and accession numbers are: Lytechinus SU2 (LvSU2; AAC23572); Strongylocentrotus αP (SpαP; AAD55724); Drosophila αPS2 (DmPS2; P12080); Human α5 (HsItgα5; P08648); Human αV (HsItgαV; P06756); Human α8 (HsItgα8; P53708); Human αIIb (HsItgαllb; P08514); Human α6 (HsItgα6; P23229); Human α7 (HsItgα7; Q13683); Human α3 (HsItgα3; P26006); Drosophila αPS3 (DmPS3; O44386); Acropora AmItgα1 (AmItgα1; EU239371); Human α4 (HsItgα4; P13612); Human α9 (HsItgα9; Q13797); Nematostella NvItgα1 (NvItgα1; XP_001641435); Caenorhabditis αPat2 (CePat2; P34446); Drosophila αPS1 (DmPS1; Q24247); Podocoryne IntA (PcIntA; AAG25993); Caenorhabditis αIna1 (CeIna1; Q03600); Geodia α (GcItgα; CAA65943). (B) β integrins. Major clades resolved here are consistent with previous phylogenies. The position of sequences within the cnidarian clade is consistent with orthology between Podocoryne IntB (PcIntB) and AmItgβ2, and groups two Nematostella βs with each Acropora β. Unlike the α integrins, the β integrins appear to have diverged independently in several bilaterian lineages. Sequences aligned, abbreviations, and accession numbers are: Human β3 (HsItgβ3; P05106); Human β5 (HsItgβ5; P18084); Human β6 (HsItgβ6; P18564); Human β2 (HsItgβ2; P05107); Human β7 (HsItgβ7; P26010); Human β1 (HsItgβ1; P05556); Strongylocentrotus βG (Urchin SpItgβG; AAB39739); Strongylocentrotus βL (SpItgβL; AAC28382); Strongylocentrotus βC (SpItgβC; AAB39740); Drosophila βPS (DmβPS P11584); Caenorhabditis βPat3 (CePat3; Q27874); Acropora AmItgβ2 (AmItgβ2; EU239372); Nematostella β1 (NvItgβ1; XP_001641468); Nematostella β2 (NvItgβ2; XP_001627336); Podocoryne IntB (PcIntB; AAG25994); Acropora AmItgβ1(AmItgβ1; AAB66910); Nematostella β3 (NvItgβ3; XP_001637894); Nematostella β4 (NvItgβ4; XP_001621822); Ophlitaspongia βPo1 (Sponge OtItgβ1; AAB66911); Suberites β (Sponge SdItgβ; CAB38100); Geodia β (Sponge GcItgβ; CAA77071); Human β4 (HsItgβ4; P16144); Drosophila β-nu (Dmβ-nu; Q27591); Human β8 (HsItgβ8; P26012). ML analyses of the integrin β sequences (Fig. 5B) confirmed the possible orthology of Podocoryne IntB with the novel Acropora β sequence (AmItgβ2) reported here. Preliminary surveys of the genome sequence of Nematostella suggest the presence of at least four β integrins, and gene models (the gene as predicted in the genome assembly, including the open reading frame, introns and untranslated regions) of these were sufficiently complete for them to be included in phylogenetic analyses (Fig. 5B) which group the Nematostella β integrins with the Acropora subunits – two with AmItgβ1 and two with AmItgβ2. It remains to be seen whether each member of these pairs of Nematostella genes has an Acropora ortholog. As in the integrin α phylogeny, the sponge sequences were relatively distant to those from the Cnidaria. Again, the analyses were broadly consistent with previous studies [20–22], resolving the vertebrate sequences into three clades known as β1 (integrin β1/2/7), β3 (integrin β3/5/6/8) and β4 in the Hughes  phylogeny. Unlike the α integrins, there is no evidence for divergence of β subunits prior to the protostome/deuterostome split. Rather, it appears more likely that β integrins have diverged independently in several bilaterian lineages. RT-PCR analysis demonstrates that mRNAs encoding each of the coral integrins (AmItgα1, AmItgβ1 and AmItgβ2) are present in eggs (Knack et al., unpublished data; ) and early developmental stages (Fig. 6) at relatively uniform levels. No specific pattern could be detected via in situ hybridization prior to the prawn chip stage however, implying that the maternal mRNA is uniformly distributed until this time. In the early development of Acropora, a clear and specific in situ hybridization pattern for AmItgα1 is first seen in late prawn chip stage embryos (early gastrula) (Fig. 7A), the mRNA being localized in a characteristic pattern on the concave side of the flattened cell bilayer corresponding to Fig. 4b in Hayward et al. . Expression is maintained in these presumptive endodermal cells as the concavity deepens and they are internalized. Staining remains strong in the presumptive endoderm until blastopore closure is complete (Fig. 7C), after which only weak endodermal staining of AmItgα1 is observed. Reverse transcriptase PCR analysis of integrin expression during Acropora development. Time points: 1-Prawn Chip, 2-Gastrula, 3-Pear, 4-Planula, 5-Settlement. All three Acropora integrin subunits show constant levels of expression throughout development. The early expression patterns of both AmItgβ1 and AmItgβ2 (Fig. 7) were broadly similar to that of AmItgα1, but with the following differences. First, it was only possible to visualize the localization of transcripts corresponding to the β integrins at slightly later stages of development. 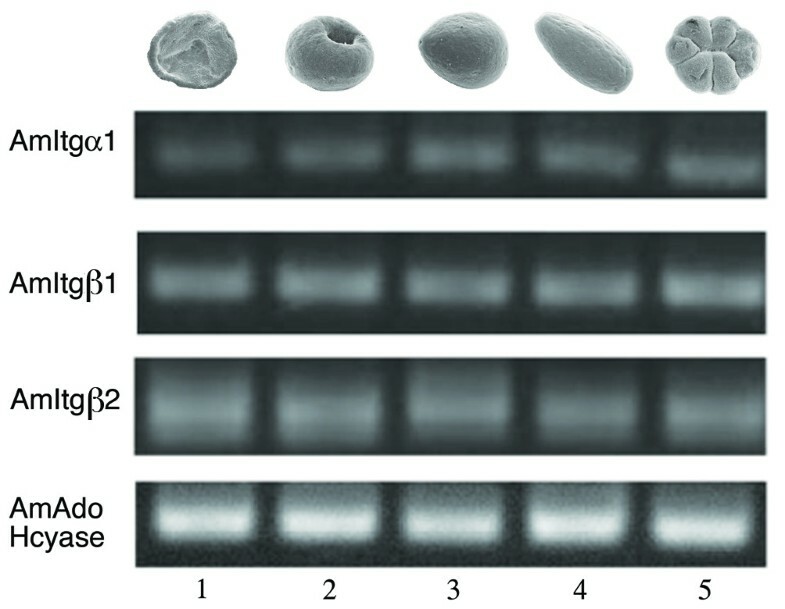 Second, whereas AmItgα1 and AmItgβ1 transcripts were tightly restricted at the area of the blastopore lip in early gastrulae (Fig 7B and 7E), AmItgβ2 was also expressed more generally (Fig 7G–I). Comparison of AmItgα1, AmItgβ1 and AmItgβ2 mRNA distribution patterns during gastrulation in Acropora. At the prawn chip stage, the AmItgα1 and AmItgβ1 mRNAs are clearly restricted to one side of the flattened cell bilayer (A, A', D). During gastrulation, these mRNAs are tightly restricted to the area of the blastopore (asterisks) lip (B, B', C, C', E, F), and throughout development remain endodermal. The distribution of AmItgβ2 mRNA (G, H, I) is broadly similar to that of AmItgα1, but is less tightly restricted, as indicated by weak general staining. Arrow heads in A, B, and C indicate the plane of the sections shown as A', B' and C'. Whereas Reber-Muller et al. hypothesized the presence of only single α and β integrin subunits in cnidarians, the integrins identified to date in Acropora are likely to be only a subset of those present. Preliminary surveys of the genome of Nematostella imply that at least four β integrins (two resembling AmItgβ1 and two more similar to AmItgβ2), and at least three distinct α types are present (data not shown). However, gene models for only one α integrin were sufficiently complete to allow its inclusion in the phylogenetic analyses shown as Fig 5A. The integrin repertoire of this morphologically simple animal is therefore considerably more complex than that of Caenorhabditis (one β and two αs), which has often been assumed to reflect the ancestral metazoan state. Due to structural constraints on integrin proteins during evolution, phylogenetic analyses are likely to be complicated by homoplasy effects. The position of the cnidarian sequences in the α integrin phylogeny (Fig. 5A) is likely due to both the early divergence of the Cnidaria and homoplasy effects. Hence, in this case, phylogenetics is not informative as to ligand binding properties. It is likely that in cnidarians, as in higher animals, distinct α integrin types participate in binding to laminin and RGD-containing ligands, but functional analyses are required to verify this hypothesis. Despite having a common pattern of cysteine loss, phylogenetic analyses (Fig 5B) indicate that AmItgβ2 is only distantly related to the vertebrate β4-type. Those cysteine residues (positions 8 and 9) in the consensus absent from the Acropora and Podocoryne sequences form the c8–c9 loop of the β A domain, which has been implicated in determining integrin-ligand specificity, specificity of α-β interactions, and signalling properties [24–28]. Whilst this loss has apparently occurred independently of that leading to the vertebrate β4 type, it may result in common consequences for ligand and/or α-subunit specificity. The presence of maternal integrin mRNAs and their relatively uniform expression through development reported here for Acropora have precedents in Podocoryne  as well as in higher animals. Co-localization of mRNAs for AmItgβ1, AmItgβ2 and AmItgα1 suggests that either or both of the β subunits associate with the α1 subunit. There are many precedents from bilaterians for RGD-type αs associating with β1-type βs (α5β1; αVβ1; α8β1; PS2βPS). Of these, α5β1 and PS2βPS have been implicated as regulators of gastrulation in vertebrates [29, 30] and Drosophila  respectively. In Podocoryne, IntA is assumed to associate with IntB (a possible AmItgβ2 ortholog) since they are co-expressed in a wide variety of locations over a range of life cycle stages , suggesting that AmItgβ2 may associate with the AmItgα1 subunit. Although integrins clearly play important roles in gastrulation in several animal groups, including vertebrates , Drosophila , and sea urchins , the interactions that have been demonstrated are heterogeneous with respect to both the ligands and types of integrins involved. The expression patterns of α and β integrin genes observed in the coral are reminiscent of expression during both amphibian and sea urchin gastrulation. Modulation of integrin adhesion to the RGD domain of fibronectin plays a central role during Xenopus gastrulation , and in the sea urchin Lytechinus changes in laminin adhesion mediated by the epithelial α integrin α SU2 are likewise important . In both the sea urchin and Xenopus, changes in integrin-mediated cell adhesion during gastrulation occur independently of transcription and translation. In Acropora, integrin mRNAs are present in eggs  and the extent to which those visualized in the presumptive endoderm reflect zygotic transcription is unknown. The simplest interpretation of the patterns of integrin expression is that they reflect increases in cell adhesion in the presumptive endoderm. Expression on the concave side of the "fat prawn chip" stage embryo, which is essentially a flat bilayer of cells (for a description of gastrulation in Acropora, see ), suggests that integrin-based adhesion may constrain the presumptive endoderm whilst the cells of the presumptive ectoderm move upward and inward around them. Whilst the cells that will end up inside the embryo may adhere to each other more tightly than they do to the putative ectoderm, as is consistent with many forms of gastrulation, the inferred increased adhesion in the putative endoderm is not consistent with a typical epithelial to mesenchymal transition. The early expression patterns of the α and β integrins in Acropora are very similar to those of two transcription factors, snailA  and otxB . Snail genes have central and conserved roles in gastrulation in Drosophila  and vertebrates  and members of the broader class of related genes are regulators of other epithelial to mesenchymal transitions (EMTs). Whilst the best understood means by which snail genes regulate cell adhesion is by acting as repressors of E-cadherin expression [36, 38, 39], in human epidermal keratinocytes the snail-related gene Slug (Snail2) is a repressor of α3, β1 and β4 integrin expression, leading to decreased cell-adhesion to fibronectin and laminin 5 . Across the Bilateria, Otx genes are conserved anterior markers  and, whilst most Otx genes are expressed in the nervous system, evidence from a diverse range of metazoans suggests an ancient role as regulators of cell adhesion (eg. [42, 43]). In Hydra, high levels of CnOtx expression correspond to regions where cells are undergoing rearrangements or movement . Both snailA and otxB are thus candidate regulators of integrin expression in Acropora. Given the similarity of AmItgα1 to diverged RGD-type mammalian integrins, it will be of particular interest to examine the expression of ECM proteins containing fibronectin type III domains during cnidarian gastrulation in parallel with adhesion studies. Candidates identified in Nematostella include predicted proteins similar to vertebrate usherin and titin, and a likely homolog of Drosophila sidekick. Whilst one might expect morphologically simple metazoans to have a correspondingly basic integrin complement, comprising perhaps just two αs and a single β subunit (as in Caenorhabditis elegans), the repertoire of these molecules in anthozoan cnidarians is considerably more complex. In the case of cnidarian α integrins, ligand specificity cannot be predicted by phylogenetic analysis, suggesting the possibility that specificity mechanisms arose independently in Cnidaria and Bilateria. During early development in Acropora, some of these adhesion/signalling molecules are expressed in patterns which parallel those of their amphibian and echinoderm counterparts, and which are inconsistent with gastrulation being a simple epithelial to mesenchymal transition. Developmentally staged Acropora millepora embryos were collected during annual spawning events. Embryos were staged based on Ball et al. (2002). Total RNA was extracted using RNAWIZ (Ambion) according to the manufacturer's protocol. RNA was treated with DNase (Fermentas) to remove contaminating genomic DNA. Single stranded cDNA was synthesised using the First-strand cDNA Synthesis Kit (Amersham Biosciences, Piscataway, NJ) using 1 μg of total RNA. One μl of this product was used as a polymerase chain reaction (PCR) template. For AmItgα1, primers AmItga1RTF (5'-GCCAATGAAACAGCTACG-3') and AmItga1RTR (5'-TTGTCTCCAGCCTTCAAC-3') were used to amplify a 130 bp product. For AmItgβ2, primers AmItgb2RTF (5'-TGGGCATTTGTGGTGTGAG-3') and AmItgb2RTR (5'-GCTTGTTCTGATGAGTGATGG-3') were used to amplify a 219 bp product. For AmItgβ1 (Brower et al. 1997), primers IB1RTF (5'-CTTGTGTTGCCACTTATGGCTT-3') and IB1RTR (5'-CTGCTACTTGCATTAACGCATC-3') were used to amplify a 144 bp product. The PCR protocol was 1 min at 94°C, then 40 cycles of 0.5 min at 94°C (denaturation), 0.5 min at 50°C (annealing), 2 min at 72°C (extension), followed by an additional extension for 2 min at 72°C.) 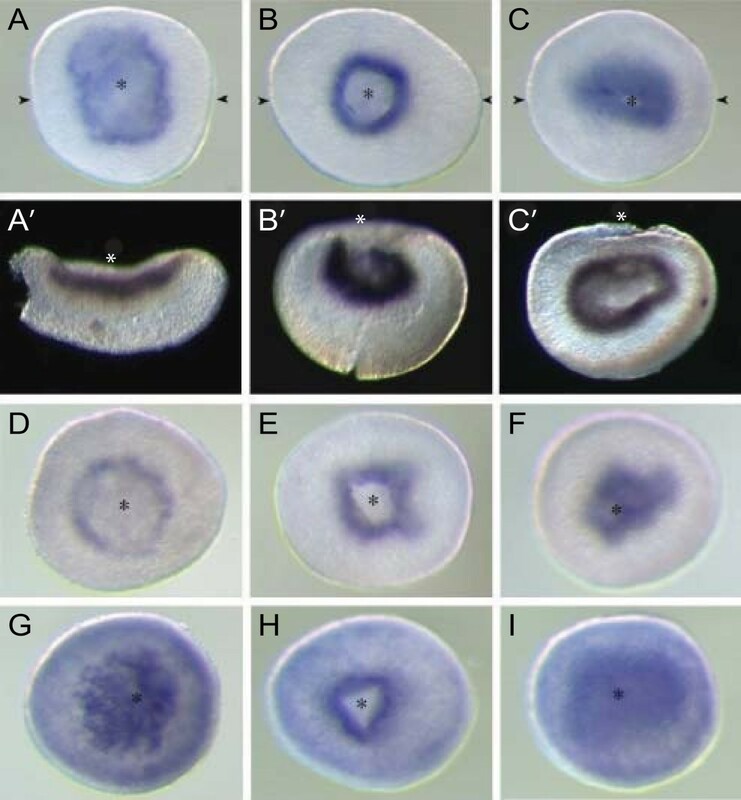 As a control, primers ADH-F (5'-AAGAAGACAAACATCAAGCCTCA-3') and ADH-R (5'-CACATCCAAGGTTCACAAGACG-3') were used to amplify a portion of coral AdoHcyase (S-adenosyl-L-homocysteine hydrolase) cDNA (unpublished data). The basic procedures for fixation and hybridization with coral embryos were carried out as described . Photographs were captured directly with a Spot digital camera. Digitised images were processed with Adobe Photoshop. Brent A Knack, Akira Iguchi contributed equally to this work. The authors thank the late Danny Brower for advice and critical input. This work was supported by grants from the Australian Research Council, both directly to DJM and EEB and via the Centre of Excellence for Coral Reef Studies and the Special Research Centre for the Molecular Genetics of Development. BAK acknowledges a James Cook University Postgraduate Research Scholarship, and AI and CS were supported by scholarships from the Okinawa International Exchange and Human Resources Development Council. BAK was responsible for conducting DNA sequencing and RT-PCR analysis, and participated in both the in situ hybridisation experiments and preparing the manuscript. AI collected and prepared coral developmental stages, assisted in DNA sequencing and, with CS, carried out in situ hybridisation experiments and photographed the results. DCH was responsible for the initial identification of clones, assisted in sequence alignment and critically reviewed both the data and the manuscript. DJM conducted the phylogenetic analyses, and he and EEB drafted and reviewed the manuscript.